It features a rectangle shape. This vessel set is designed to be installed as a above counter vessel set. It is constructed with ceramic. This vessel set comes with a enamel glaze finish in White color. It is designed for a single hole faucet. Above counter white ceramic rectangular vessel. Completely finished from all sides including back. Premium white glaze for a glossy finish. Single lever water and temperature control. Standard US plumbing connections. Kiln dried ceramic construction. Smooth non-porous surface prevents from discoloration and fading. Drain and vessel feature an overflow. Only faucet is CUPC approved. Faucet complies with North American Plumbing Standards. Compliant products are required by city inspectors. 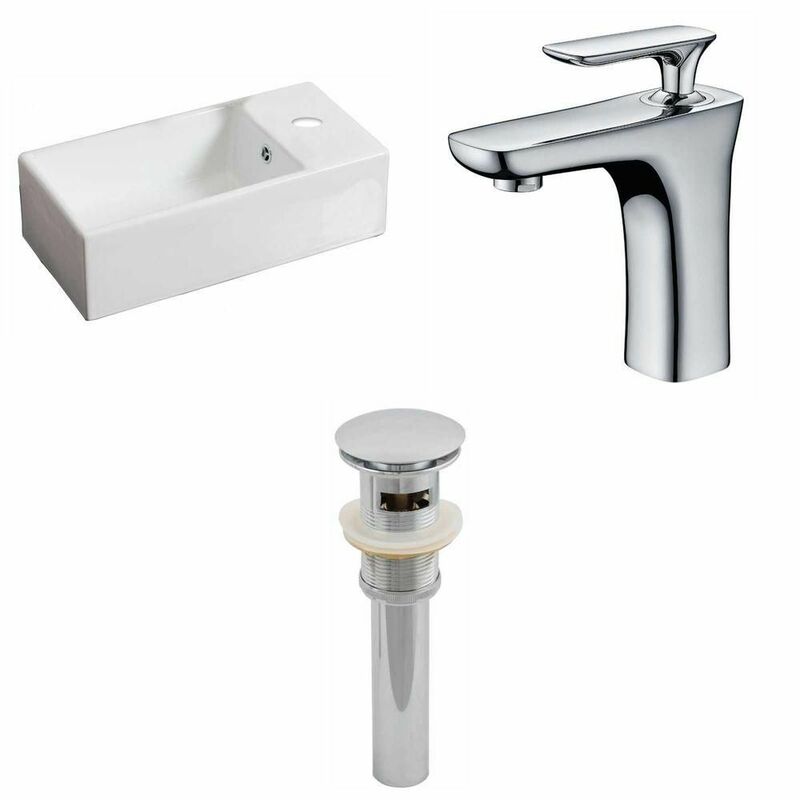 Faucet features a high-quality ceramic cartridge. All mounting hardware is included. Double fired and glazed for durability and stain resistance. Quality control approved in Canada. Designed for easy installation. Features a high quality solid brass construction ensuring durability. Re-inspected prior to shipping your order. 1.75-in. standard US drain opening. Complete pop-up drain assembly included. Quality control approved in Canada and re-inspected prior to shipping your order. This traditional vessel set belongs to the exquisite Emily design series. It features a rectangle shape. This vessel set is designed to be installed as a above counter vessel set. It is constructed with ceramic. This vessel set comes with a enamel glaze finish in White color. It is designed for a deck mount faucet. It features a rectangle shape. This vessel set is designed to be installed as a wall mount vessel set. It is constructed with ceramic. This vessel set comes with a enamel glaze finish in White color. It is designed for a single hole faucet. 18-inch W x 10-inch D Rectangular Vessel Sink in White with Faucet and Drain It features a rectangle shape. This vessel set is designed to be installed as a above counter vessel set. It is constructed with ceramic. This vessel set comes with a enamel glaze finish in White color. It is designed for a single hole faucet.